To take a https://continuinged.certainteed.com/index.php click on any of the course titles or the "Take Course Now" button. You will be redirected to the E-Learning sign-in page where new users can register and existing users can sign-in. Complete the course as your time permits, the program will remember where you stopped and allow you to resume where you left off when you return. Upon completion and successful test, your credit will be automatically reported to the AIA. Free Wood University Related Courses- Click Here! CLICK HERE FOR MULTIPLE COURSES! Many Listings- SOME ARE DUPLICATES FROM ABOVE LINKS! Free on-line course for "The Attic: Three Components, One System "
Free on-line course for "Essentials of Masonry"
Free on-line course for "Professional Carpentry"
Free on-line course for "Why Build With Steel? Utilizing Light-Gauge Steel Framing Systems"
Free on-line course for "Protection Against Termites and Decay"
Free on-line course for "Engineered Wood Basics"
Free on-line course for "Design of Wood Connections"
Free on-line course for "Metric and Wood"
Free on-line course for "LEED Certification and Sustainable Steel Building Systems"
Free on-line course for "Finger Jointed Lumber "
Free on-line course for "Engineered Wood Products"
Free on-line course for "Connection Design"
Free on-line course for "Designing for Permanence"
Free on-line course for "Lateral Load Resisting Systems for Wood Structures"
Free on-line course for "Designing for Stability in Wood Members"
Free on-line course for "Conventional Floor Framing"
Free on-line course for "Conventional Wall Framing"
Free on-line course for "Lateral Load Bracing"
Free on-line course for "Roof / Ceiling Framing"
Free on-line course for "Introduction to the Wood Frame Construction Manual"
Free on-line course for "The Basics of Wood Frame Construction"
Free on-line course for "What Is Conventional Construction?" 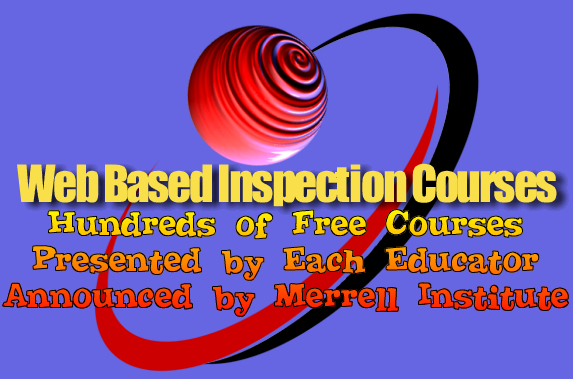 Free on-line course for "Characteristics of Wood"
Free on-line course for "Grade Marks "
Free on-line course for "Introduction to Insulating Concrete Forms"
Free on-line course for "Wood Frame Construction Manual 1995 SBC High Wind Edition"
Free on-line course for "Wood Frame Construction Manual"
Free on-line course for "Design of Wood Frame Buildings for High Wind, Snow, and Seismic Loadings"
Free on-line course for "The Exterior Wall: A Systems Approach "
Free on-line course for "Creating Custom Curves: Adding Interest to Architectural Designs"
Free on-line course for "Introduction to Decking & Railing Systems "
Free on-line course for "Evolution of Footing Forms "
Free on-line course for "Principles of Attic Ventilation "
Free on-line course for "The ABC's of Trench Drainage"
Free on-line course for "The Science of Specifying Moisture and Mould Control in Framed Wall Assemblies"
Free on-line course for "The Science of Specifying Moisture & Mold Control in Framed Wall Assemblies"
Free on-line course for "Fluid Applied Waterproof/Air Barriers for Moisture Control and Mold Prevention in Wall Construction"
Free on-line course for "Moisture Management in Sidewall Construction"
Free on-line course for "Asphalt Shingles "
Free on-line course for "Low Slope Bituminous Roof Systems "
Free on-line course for "Roofing and Glazing Polycarbonate Sheeting Systems"
Free on-line course for "Cool Thermoplastic Roofing Systems for Sustainable Buildings"
Free on-line course for "The Use of Self Adhering Systems in Low Slope Roofing "
Free on-line course for "Single-Ply Commercial Roofing"
Free on-line course for "Reflective-Protective Roof Coating Systems"
Free on-line course for "Walkable Roof Deck Membranes"
Free on-line course for "HVAC Ductwork: Issues, Answers & Practical Considerations "
Free on-line course for "The Heart of the Home: Specifying Today's Gas Fireplaces"
Free on-line course for "Windows: An Inside View "
Free on-line course for "Float Glass Manufacturing and Architectural Glass Products"
Free on-line course for "Specialized Steel Doors and Frames"
Free on-line course for "Impact Resistant Glazing Systems for Coastal Construction"
Free on-line course for "Historic Window Rehabilitation"
Free on-line course for "Commercial Upward-Acting Sectional Doors"
Free on-line course for "Understanding Special Purpose Doors and Windows"
Free on-line course for "Design Standards for Wheelchair Lifts and Elevators"
Free on-line course for "Acoustical Ceiling and Wall Systems"
Free on-line course for "Acoustical Basics for Ceiling and Wall Systems"
Free on-line course for "Sound Control and Acoustics for Architects"
Free on-line course for "Flooring Safety: Code Requirements and Guidelines For Interior Finishes"
Free on-line course for "Providing Stage Access in Schools, Churches and Performing Arts Centers"
Free on-line course for "Thermoplastic Technology in Architectural Railing Systems"
Free on-line course for "Quiet in the Classroom: Acoustics for Learning Environments"
Free on-line course for "Fire Design for Code Acceptance "
Free on-line course for "Fire blocking and Draft stopping"
Free on-line course for "Life-Saving Design: Advanced Egress-Routing Systems"
Free on-line course for "Fire-Resistant Ceiling and Wall Assemblies Using Gypsum Board Products"
Free on-line course for "Understanding Quartz Surfaces"
Free on-line course for "Designing with Siding "
Free on-line course for "Flooring Over Concrete Slabs: Avoiding Failure Through Moisture Mitigation and Proper Design"
Free on-line course for "Fiber Cement Siding"
Free on-line course for "The Science and Technology of Coatings Performance"
Free on-line course for "Building Material Basics, Vinyl "
Free on-line course for "Rain Screen Assemblies and Composite Cladding"
Free on-line course for "EIFS: Critical Details"
Free on-line course for "Paint 101: What is Paint?" Free on-line course for "Essentials of Plumbing"
Free on-line course for "The Ever-Expanding Reach of Ergonomics: From Architecture to Faucet Design"
Free on-line course for "Custom Shower Systems"
Free on-line course for "Vinyl Fence Systems "
Free on-line course for "The Systems Approach to Designing a House:1, 2 AND 3"
Free on-line course for "Façade Anchoring Systems and Adjustable Concealed Lintels"
Free on-line course for "Speech Privacy in Healthcare Environments"
Free on-line course for "Designing Interfaces for Glass and Metal Curtain Wall Systems"
Free on-line course for "Design and Specification of ACM / MCM in Today's Architecture"
Free on-line course for "Expansion Joint Covers"
Free on-line course for "IBC Seismic Code and Ceiling Installation Requirements"
Free on-line course for "Speech Privacy in Office Design"
Free on-line course for "Building Green Exteriors Using Fiber Cement Products"
Free on-line course for "Providing Courtroom Access to Witness Stands and Judges' Benches"
Free on-line course for "The Restoration of Frank Lloyd Wright's Falling water"
Free on-line course for "Specifying Pews for Worship Facilities"
Free on-line course for "Accessibility & Detectable Warning Systems: Complying with Current Government Guidelines"
Free on-line course for "Color Foundations"
Free on-line course for "The Greening of 'White Goods': Environmental Considerations When Specifying Appliances"
Free on-line course for "Building Codes & Wood Design"
Free on-line course for "Building Code Update "
Free on-line course for "The International Residential Code and Wood Construction"
Free on-line course for "Wood Structural Design in the International Building Code 2000"
Free on-line course for "Understanding Construction Documents - Module 1: An Overview of the Construction Process"
Free on-line course for "Understanding Construction Documents - Module 2: Construction Contracts"
Free on-line course for "Understanding Construction Documents - Module 3: Construction Contract Modification"
Free on-line course for "Understanding Construction Documents - Module 5: Conditions of the Contract"
Free on-line course for "Understanding Construction Documents - Module 6: Division One - General Requirements"